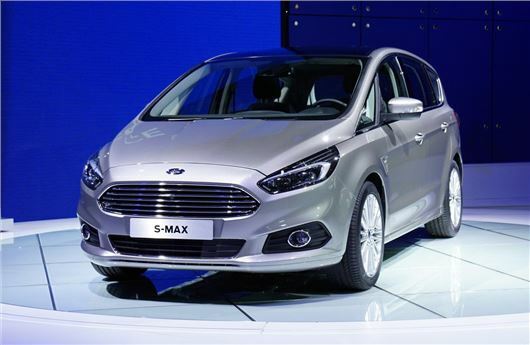 Ford has premiered its all new five and seven-seat S-MAX at the 2014 Paris Motor Show. Ford says the new car retains the enjoyable driving characteristics of the outgoing model, but with improved quality, more technology and better practicality. Sales are due to start in Summer 2015, and expect prices from around £23,500. Key features include new safety equipment, including a more rigid body shell, as well as the addition of MyKey to restrict vehicle speed or radio volume when the car is being driven by a younger driver. There’s also a new stability control system to improve safety through corners and to reduce the chances of a rollover. Other technology on offer includes traffic sign recognition, blind spot assist, lane departure warning, lane keep assistance and even automatic parking for both parallel and perpendicular parking spaces. The cabin is kitted out with the latest technology including an optional fully digital dashboard with a 10-inch display. It features the usual speedo and tachometer, along with customisable displays. There’s also an 8-inch touchscreen with the latest Ford Sync 2 system, which is more user-friendly than the old one. The rear seats can be electronically folded with a control panel in the boot, while the boot lid itself can be opened hands free by moving a foot under the rear bumper. The engine range includes three diesels with outputs of 120PS, 150PS and 180PS, the most powerful of which is available with a powershift dual-clutch automatic transmission. Petrol options are a 160PS 1.5-litre and a a 240PS 2.0-litre Ecoboost, the latter of which comes with an automatic transmission. Final emissions and economy figures are to be announced nearer the cars on sale date, but expect an improvement over the outgoing car.